Canal Era Performances, workshops, and residencies for schools, historic sites, libraries, and other public venues. Please click here to link to a brief printable PDF Flyer of our Erie Canal programs for children and families. Read details below for our school and public interdisciplinary multicultural arts programs. Students discover multi-cultural & historical interrelationships as they become immersed in this vibrant portrait of Canal Era culture and lore. Heritage traditions in music, instruments, folkways, literature, and dance are the creative artistic centerpieces of this workshop/performance artist residency sequence. Topics in Social Studies curriculum are also illuminated by music, dance, and visual arts (including immigration, how 19th c. settlers adapted to American culture; the importance of waterways in economic development; cultural impact of canals, and more.) Historic photographs and paintings can be explored as documents, in a 'Document Based Query' (DBQ) component. Language Arts Skills are enriched through theatrical performance, tall tales, guided discussions, and if desired, coordinated teacher-driven student writing projects. Mini-residencies may run anywhere from 1 to 5 days. In-depth residencies run 2-3 weeks, and may incorporate student playwriting, instrument building/playing, and other projects. Longer residencies often feature a unifying project goals --- such as a History Pageant or a 19th Century Faire – and can incorporate additional projects such as ballads as oral literature, songwriting, costuming, dance calling. A variety of funding resources are available for residencies; please inquire for application information, guidelines, and deadlines. Tall tales, vintage instruments, and actual historic characters bring history to life in this vibrant, interactive portrait of the Erie Canal. Crafted in the popular 19th century style of a 'folk operetta,' this is an authentic performance piece that totally immerses audiences in the Canal Era, featuring cameo roles, participatory movement, and favorite canal sing-alongs. a. For stand-alone performances, audiences can participate in the play spontaneously, learning the songs� easy choruses and movements 'on the fly' just as they would have back in a Canal Era performance. b. When presented as a residency culmination, the performance can feature children�s prepared singing roles, and shared with student peers, parents, or community. Other possible additions to a culminating performance: canal-era dancing, student-written Tall Tale vignettes, History Faires, or special projects on small or large scale. We are pleased to work with you to custom-create a complete program to suit needs, resources. c. Theater Craft Pre-Performance: To enrich the audience�s understanding and appreciation of the art of staged performance, the artists will take the students 'behind the scenes,' and speak with them while setting the stage for the play. By taking students through the steps of preparing sets & props, their characterizations, vocal & physical warm-ups, the students learn the actual creative process of a theater performance. This can serve as a dynamic bridge in residencies or mini-residencies where the play is to be performed as a culmination to workshops, and as an especially valuable component of longer residencies when students may be preparing skits for performance, deepening their understanding of, and use of, performance space and process. An interactive workshop program crafted to bring to life the people, culture, & history of the Canal Era, with an emphasis on helping students discover historical and multicultural interrelationships. 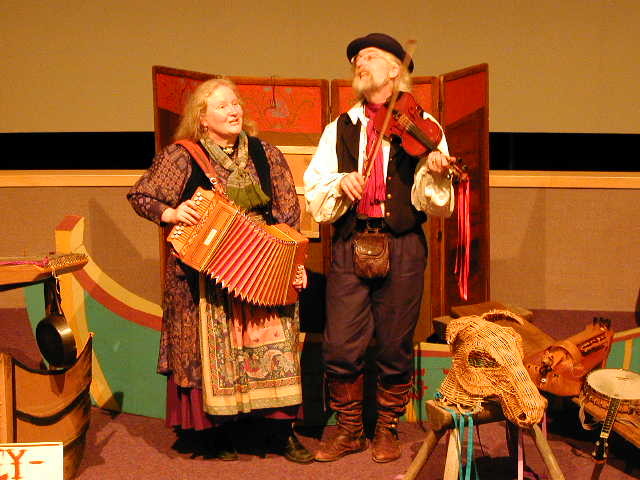 Using masterfully played historical instrument collection as a starting point, the artists teach across the curriculum, connecting music with history, geography, immigration, and multicultural topics. What are the origins of present-day our unique and distinctive cultural character? How did diverse immigrant cultures become Americanized? In this up-close, interactive workshop, the artists use their historic instrument collection to address the importance of immigrant cultural contributions, transportation, economics, and other social factors important in the shaping of a region. Whether Irish (harp, bagpipes, pennywhistle), French (hurdy gurdy), German (hackbrett/ hammered dulcimer), African-American (banjo), or English (squeezebox)...music clearly imparts the special flavor of each culture�s unique contribution. Students learn about history hands-on while they enjoy the traditional steps, styles, and instruments that reflect on our multicultural heritage. Dancing was a central part of community life in early America, binding new communities together through cherished old traditions. It is the lively and distinctive legacy of the immigrants who settled along our waterways, and later with coming of the Canal Era, arrived to create new waterways. Participants will discover the historical background, characteristics, & significance of dances representing these immigrant cultures, and experience traditional dances� distinctive rhythms, movements, and formations. Dances are carefully selected according to age & expertise of participants. The ease and enthusiasm engendered by dancing to live music is contagious, as the workshops are driven by music on authentic period instruments. If desired, dance workshops may culminate with peer sharing presentations, or featured at daytime or evening history faires, celebrations, and concerts. An exciting hands-on activity! Historic paintings, photographs, maps, and other documents provide an informed and accurate understanding of what life was like during our Canal Era. In this program, students reflect upon and discuss a collection of primary source images, to gain appreciation and understanding of a historian�s techniques and processes. They develop critical thinking skills as students learn how to build and support concepts with scaffolding questions, and to extract information to support new ideas. Participants will leave with an understanding of the important role that canals played in American history, of the people who came to build them, and how their lives and culture compare with our own. Limited audience size allows for lively dialogue that involves students. Costuming Option: Students can prepare for their culminating event by learning how to assemble simple costumes and accessories, as evidenced in the primary source materials presented in the slide forum. Part V. In-Depth Projects/Culminating Events: These range from a simple Sharing Informances by dance workshop participants --- to student collaborative song-writing, or tall-tale skit-writing activities and performances --- to thematic Historic Faires or Canal Festivals. Residencies may also incorporate heritage instrument building and/or playing. Request more information from artists. �2016 Sondra Bromka. All rights reserved in all media.